A detailed map of New Zealand. Auckland is zoomed in because 35% of New Zealand's population live here. 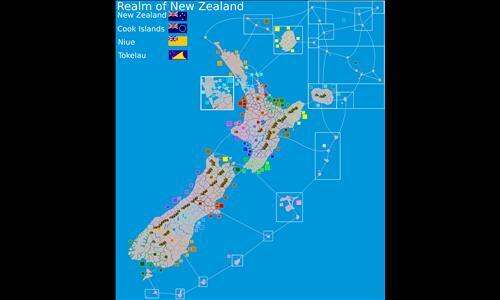 Niue, Tokelau and Cook Islands are part of the Realm of New Zealand. Review by Clint Eastwood on 5/18/2017. Wow, you finished this a lot quicker than I expected. Great job! It turned out very nicely. Better than anything I've made so far. 1. There's no connection line between Resolution island and Fiordland National park. A connection line would be somewhat redundant, since it only makes sense that they would connect, but for the sake of continuity, I suggest you add one. 2. Kaikoura overlaps with a mountain on its western border. Thanks! I have corrected the errors. A new version will be public soon. Review by NinjaNic on 5/17/2017. Nice map!! Some of the bonus colors are really similar, though, making it hard to differentiate what territory goes where. I really like maps of this size which are great for team games. Keep it up! Review by Nathan on 5/17/2017. This is a very attractive, very well-planned map. My only suggestion for improvement would be to provide for greater mobility on the western coast of the north island. Specifically, including a connection from Collingwood (or Opunake) to either or both of Auckland and the Three Kings Islands (and Auckland to the Three Kings) would really speed up the pace of games that might otherwise bog down in the Northland, Auckland and Waikato regions. I like your suggestion, but I think a connection between Three Kings Islands and Opunake is a bit extreme. I'll keep it the way it is, but thanks anyway. Review by Steveabode on 7/20/2017. Review by Kiwi on 7/30/2017. Review by Arachnocat14 on 5/2/2018. This is an amazing map with impressive detail. I like the fact that the bonuses are not all essentially the same and I also like the mountains. I am not sure what all the extra boxes in the upper right corner are for though. Review by A_B3 on 12/22/2017. Surprisingly challenging. A good play. Review by Nathan Wakelin on 4/13/2018. Review by King Sean on 10/8/2018. Review by Warlord on 10/15/2018. Review by Olkani [PG] on 6/9/2017.